'Et in Arcadia Nos' is a family portrait among other things. I actually started painting my partner Jane in before any of our children had arrived; the boys slowly found their places in the picture as it evolved, but by the time our youngest child came along I had run out of space. We sometimes joke that she's the gorilla. The title ('We too are in Arcady') is a reworking of 'Et in Arcadia Ego', the name of Poussin's famous painting: 'I too am in Arcady' (the 'I' refering to Death). 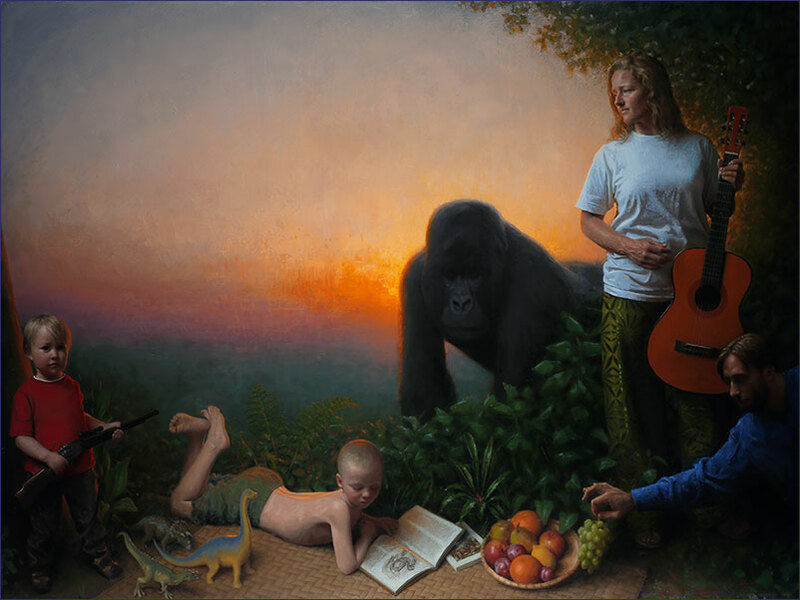 Changing the 'I' to 'We' in my picture underlines its family aspect, but it is also intended to draw viewers into the painting's world, to implicate them in its situation. Arcadia stands for a mythical golden age of humanity, a paradise in which nature was so abundant and life so simple that there was no need for intelligence or foresight. The Arcadians thus lived in a state of childlike innocence; a perpetual present, without fear, unaware even of their own mortality. 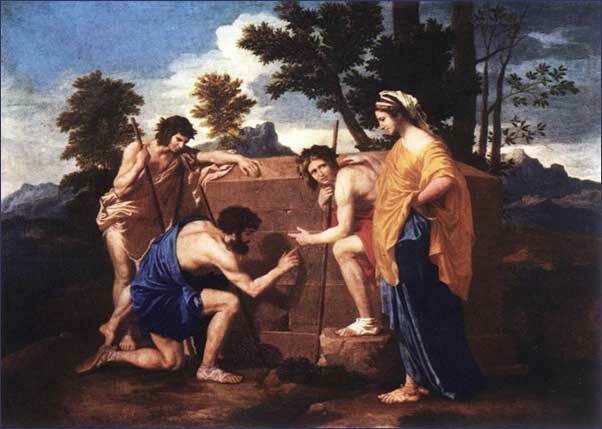 In Poussin's painting some Arcadians have come across a tomb and, deciphering it's motto, for the first time comprehend their fate. One might argue that, in terms of affluence and life-expectancy, humans have never had it so good: if any time can be called a Golden Age surely it is ours. But our affluence has also bred a childlike optimism, a disconnection from the harsher facts of life and the harder lessons of history. Ignoring these, we sow the seeds of our own destruction. Project figures for CO2 emmissions, natural resource consumption, habitat loss and extinction of species into the future, the numbers seem to anticipate a vast tragedy:"I too am in these numbers"
I remember a friend bursting into tears at the sight of her sister in one of my paintings. Transformed by my Old-Masterish style, her sister's image seemed to be lifted out of the present, to belong to the past, as if she was already lost. Seen for the first time, the painting seemed like a premonition of death, a momento mori. 'Et in Arcadia Nos' is a sort of family memorial, anticipating our deaths, perhaps even our extinction as a species. It presents an image of a more harmonious relationship with Nature, but it's not intended to be a very realistic one. It's more like a repository of transient pleasures and loves; of unfulfilled hopes and dreams. It shows how we would have liked to have lived, but failed. Somehow the nostalgic, regretful, elegiac sensibilty that goes with this type of painting seems entirely appropriate.